NPR News Nuggets: Super Bowl LI Prep, New State Flags & Science On The Catwalk Here's a quick roundup of some of the mini-moments you may have missed on this week's Morning Edition. 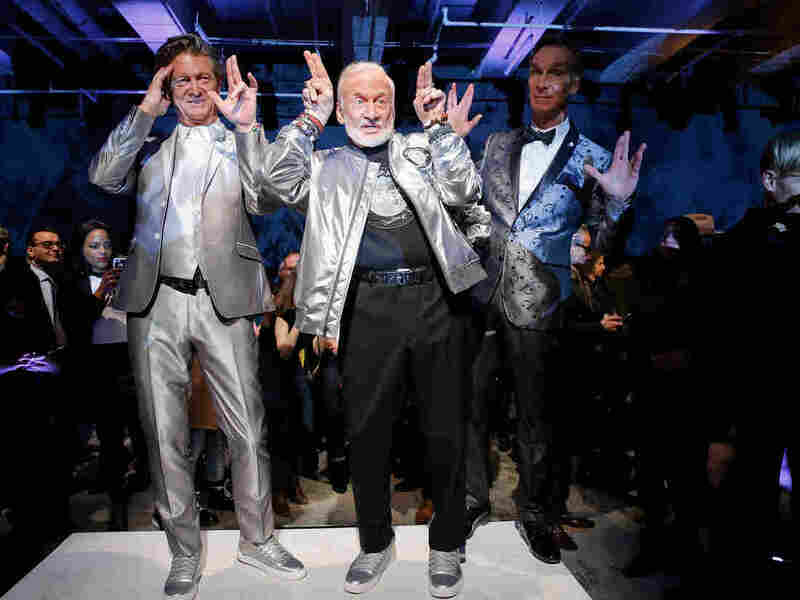 Designer Nick Graham, astronaut Buzz Aldrin and scientist Bill Nye pose on the runway at Graham's New York Fashion Week show. As those at Houston's NRG Stadium, and the rest of Space City, get ready for the madness that is Super Bowl LI to overtake the town, the players of both the Atlanta Falcons and the New England Patriots are preparing, too. However, the Falcons have decided one of the best ways to prep is to not play football, but instead grab some paddles for a game of ping-pong. As Morning Edition host Steve Inskeep explained on Monday, Falcons Coach Dave Quinn said the team has three tables in their locker room. Quinn also said that the game has helped the players bond and one player said the game helped with hand-eye coordination. That's probably true. I mean it's a lot harder to catch a snitch than score with a quaffle, right? So with the championship on Sunday, we'll have to see if this two-sport prep helps their game. All I ever wanted in elementary through middle school was to get to the cafeteria for lunch and hear one of peers cry out "FOOD FIGHT!" creating a free-for-all of flying food. That was then. Now, I don't find the idea of counting how many shampoos it would take to get peanut butter out of my hair very appealing, and while a childish food fight might sound fun, getting beaned by a potato while on a run just sounds dangerous. And yet, that's exactly what people in Gloucestershire, England are dealing with, according to Morning Edition host Steve Inskeep. This mystery food-thrower did, indeed, hit a woman jogging with a potato. Another person dodged a turnip from a passing car. There was another report of a street egging. And then another incident where a driver targeted a pedestrian with an avocado. Needless to say, at least Americans know the value of guacamole these days. The Nebraska state flag. Yay or nay? As a proud Texan, I take every opportunity to sport the state's flag. Luggage tags, actual flags and shorts (yes, really) are just a few items. 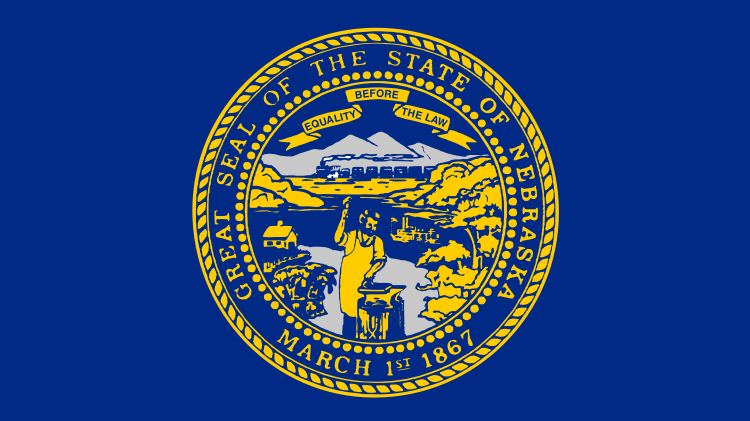 The same cannot be said for the state flag of Nebraska. Even State Sen. Burke Harr agrees. Nebraskans just don't have that same pride in their flag. As Morning Edition host Steve Inskeep told us on Wednesday, Harr said the flag flew upside down at the capitol for 10 days and nobody noticed. There's a lot going on with the flag though. It features a blacksmith hammering an anvil; a steamboat; a passing train. So maybe it's just too much for people to clearly see while standing at the bottom of the flag pole. Maybe if this flag re-design happens, the state will take a more minimalist approach of keeping it simple. Maybe? New York Fashion Week. A week full of beautiful people showcasing the newest looks from top designers and newcomers alike. This week the average IQ of those on the catwalk was probably skewed a bit when Bill Nye the Science Guy and astronaut Buzz Aldrin suited up. As Morning Edition host Rachel Martin said on Wednesday, both Nye and Aldrin wore designs from Nick Graham. "Life on Mars" was the theme of Graham's show. In keeping with his own fashion, Nye wore a bow tie with his gunmetal suit, while Aldrin rocked a metallic bomber jacket. Is the fashion out of this world? You decide. Looking for something to do this weekend besides watch the Super Bowl? Well if you have 10 hours, you can do exactly what Oklahoma resident Hunter Hobbs did, according to Morning Edition host Rachel Martin. One of Hobbs' dreams was to scroll to the bottom of a Microsoft Excel spreadsheet in one sitting without using any keyboard shortcuts or taking breaks. So, he did it. Hobbs recorded himself sitting at his computer with a finger on the arrow key. Before he began Hobbs said, "This is probably the dumbest idea ever, but hey, somebody's gotta do it." Do they really though, Hunter? Final time was nine hours, 36 minutes and 10 seconds. So if you're really looking to get rid of almost 10 hours of your life that you definitely won't get back, go ahead. Oh, and in case you were wondering, there are 1,048,576 rows in an Excel sheet.